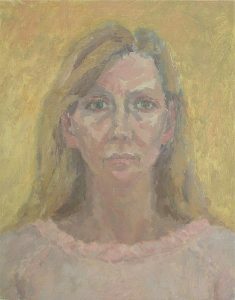 I am a figurative painter working directly from the subject either out in the landscape, in my car or in a studio overlooking the Suffolk coast. I like the limitations this imposes, a given space, a certain amount of time and a few materials with natural light. Larger work is then painted in my studio at home from these smaller works. Oils are my favoured medium as I love their painterly qualities and the diverse colour range achieved with a limited palette. 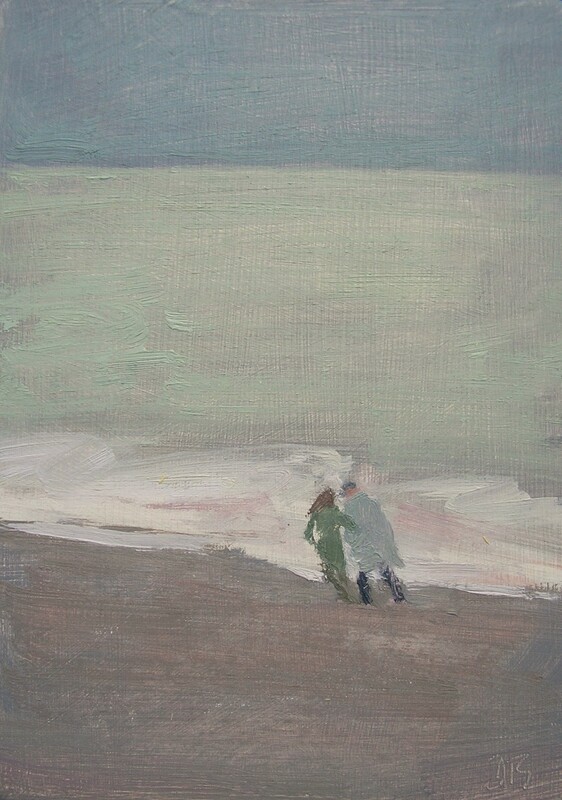 I enjoy painting figures, either walking, sitting, standing, in conversation or quiet reflection. Normally from a distance as I enjoy simplifying what I see, omitting unnecessary detail, emphasising close tones, and using these elements to evoke a mood or atmosphere. I am very interested in a strong underlying two-dimensional design and find Suffolk’s ever changing coastal landscape endlessly inspiring; the figures becoming part of the tapestry of a compelling composition. I put a great deal of emphasis on drawing believing that it underpins all good painting. For me observational drawing is investigation and a record of my experience of seeing; it informs my painting and the choices I make in my work. Life drawing is an essential part of my practice creating a deeper understanding of my subject, the figure, the space it inhabits, and the formal arrangement of these two elements within the support I am working on. I have travelled widely painting and studying Western Art. Keeping a sketchbook/journal whilst touring around and visiting any galleries and exhibitions that interest me informs my painting. A lot of my paintings are of figures walking in a landscape, an activity that I enjoy either here or away on holidays. I love to be walking in the landscape, over hills, by the shore and through interesting towns and cities, or mostly under an enormous Suffolk sky enjoying the connection I have with the place I am walking in. Always looking, always absorbing and always selecting. This all inspires my painting.